Details of the final Saturday walk are now given here. Ivybridge has been awarded the accolade of a Walkers are Welcome Town status. Members of the walking club are joining us on the Friday and Saturday. Click here to see their brochure. On the Wednesday evening at the Drewe Arms, two Morris sides will entertain us before the show. They will gather at 6.30 and take it in turns to dance until 7.45. See here for more information. 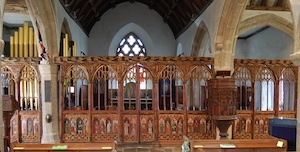 At the end of the Thursday walk, in addition to tea and cakes in Holne Church, conservator Eddie Sinclair, a long time friend of John and the Oysters, will be in the church to introduce the medieval painted rood screen that she has restored. The Thursday evening show at the Barrel House in Totnes is sold out. Thursday: any idea what sort of time you might make it to Hameldown? We have planned to join you at maybe Grimspound…and then to lunch and onward to Holne in the afternoon. It would be a shame to miss you!! Not sure of times right now. We will reply again before Thursday. Even better, come to the Drewe Arms on Wednesday evening….